Drawing on past licensing deals in the biotech space, one can see a major shift in licensing deals strategy. Big pharma is placing large bets on early-stage assets that could potentially provide pharma with long-term growth. A major challenge that licensors and licensees face is valuation of such assets. How do you ensure a “fair” value sharing? Clinical Development Costs and Time-frame: to estimate the time needed for completion of the clinical trials is difficult. You would need to be clear on the time needed for: recruiting patients, completing the trial, evaluating and interpreting results. In terms of costs, you would need to estimate the number of patients to be participate in clinical trials as well as any labour costs and overheads. Sales Forecast Profile: it is very difficult to develop sales forecasts for a product that is currently at the research or pre-clinical stage for various reasons including: uncertainty of the status of the market (competitors, disease status etc.) when the product is approved, pricing of the product upon approval and estimating the exact target patient population. As a result, a flexible licensing model is needed that can incorporate different scenaria based on the assumptions above. In the deal model, three scenaria have been developed: base case, best case and worst case. Sales forecasts: Blockbuster sales forecast profile (peak at ~$3 b.) in the base case scenario. Discount Rate: ~10% for the licensee and ~20% for the licensor, given the high risk involved. R&D expenses (Licensee): Phase I – $10 m., Phase II – 30 $m., Phase III – $75 m.
Operating expenses (Licensee): COGS – 15% of sales, SG&A – 20% of sales. Based on the scenario selected value sharing changes. In the best case scenario the licensee receives 72% of the value, in the base case he receives 60% and in the worst case he receives 21%. The value that is shared to the licensee drops as the scenario gets worse. The reason is that missing sales forecasts mainly harms the licensee, as it is the licensee that usually incurs the R&D expenses but receives nothing back (milestone and royalty payments) until the product is commercialised. Even upon commercialisation, the sales forecasts are risk adjusted based on probability of success rates. Therefore, if actual sales do not meet expectations licensee’s value in the deal is minimised. In opposite, the licensor should be worried about meeting the milestones rather than future sales. More than 90% of the value to licensor comes from upfront and milestone payments, while royalty payments account to less than 10% of the value attributed to the licensor. That is because, royalty payments are too far in the forecast period and therefore, their risk-adjusted present value is really low. In conclusion, a simple but flexible model is a key tool for understanding the value of your products as a biotech start-up. Using a multiple-scenario deal model allows companies to track the changes in the NPV sharing structure, which can be leveraged during deal negotiations with big pharma. Modern Portfolio Theory suggests that every portfolio has its risk and its corresponding rate of return. Markowitz (1952) showed that there is no “best investment” but rather a “best” trade-off between risk and return, called efficient frontier theory. This theory is based on a critical assumption: the risk and return profile of an asset or portfolio when constructed, is based on historical prices of the assets within the portfolio. As a result, a trader should not fully rely on Markowitz’s theory when making an investment decision; future returns / risk will not necessarily lie on the efficient frontier curve (which is discussed below). The following formulas need to be considered to understand how the efficient frontier graph is built. Now, lets take the following example: Say you have an X amount to invest in two assets – stocks and bonds – with equal split. Therefore, you decide to invest in Apple and in the U.S. 10Y Treasury Bill (U.S. government bond). What is the risk and return of your portfolio? What is the optimal split? Step 2: Apply the ln formula. Take ln of the ratio of Price at day i divided by Price at day i-1 applied to the whole sample (in this example the time period is 11 months, 6.1.2016 – 6.12.2016). Step 3: Calculate the average return and risk of Apple’s stock and TBill’s yield (for average see formula 1 and for risk see formula 4). Step 5: Construct the covariance Matrix. In this case, since there are 2 assets, it is a 2×2 matrix. Step 6: Calculate the return and risk of the portfolio using formulas 3 and 5, respectively. As you can see the inflection point is at a 70/30 split. Take the 60/40 split (1 point below the 70/30 split in the graph). You receive a return of ~8.7% and a risk of 1.4%. However, that would not be a wise investment decision. That is because, in the 90/10 split (2 points above) you can receive a higher return (~9.4%) with the same risk of 1.4%. As a result, in theory you shouldn’t construct this portfolio with a weighting less than 70% of Apple’s stock. Considering the example above, I will now examine the application of the efficient frontier theory to Biotech. The analysis is done for midcap and largecap firms based on 5-year historical data of stock prices (June 2011 to December 2016). The following 6 portfolio sets analyzed: Mid cap, Mid cap with Treasury Bill, Large cap, Large cap with Treasury Bill and finally, Large cap with Mid cap and Treasury Bill. Two scenarios have been constructed under the latter portfolio: starting with Mid cap weight of 100% and moving down to 0% with a 10% step and by keeping Large Cap weight equal to that of Treasury bill, and the second scenario starting with Large cap weight of 100% and moving down to 0% by keeping Mid cap weight equal to that of Treasury bill. Mid cap: in this analysis, I have included companies with market capitalisation between USD 1 bn. and USD 10 bn, while large cap are firms with market cap larger than USD 10 bn. Therefore, the Mid cap sample includes: Alkermes, Jazz Pharmaceuticals, OPKO Health, United Therapeutics, Exelixis, Neurocrine Biosciences, Alnylam Pharmaceuticals, ACADIA Pharmaceuticals, ARIAD Pharmaceuticals, The Medicines Company, Sarepta Therapeutics, Lexicon Pharmaceuticals, Depomed and Emergent Biosolutions. Large cap: this includes big biotech companies such as Amgen, Gilead, Celgene, Biogen, Regeneron Pharmaceuticals, Alexion Pharmaceuticals and BioMarin Pharmaceutical. It should be noted that in both the Mid cap and the Large cap samples the weighting is split equally between the different companies. 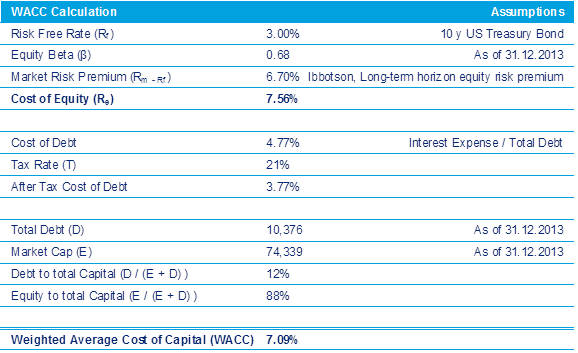 The first observation from these results is that, surprisingly, the Mid cap with Tbill portfolio does not follow the risk return profile according to Markowitz. In fact, the Mid cap graph exhibits a linear risk / return relationship (the actual formula derived from this sample is Return = 13.8*Risk – 0.2). From a financial aspect, the linear midcap line and the Mid cap with Large cap = TBill graph (purple line) would not be wise investment decisions, as you can get the same risk with a much higher return. Similarly, the Large cap with TBill is a better investment rather than the Mid cap with Tbill rather which is slightly shifted away, exhibiting a higher risk. The shaded red area is a bad investment. Instead, if you decide to invest between the two blue lines the Large cap with TBill portfolio is a clear winner. Above these lines it is an area of personal taste i.e whether you want to invest in a riskier portfolio (Mid cap with Large cap) with higher return a less risky portfolio (Large cap with TBill) with lower return. However, by looking at the actual numbers, at a 100% Large cap portfolio you get the highest return of 18.4% for a risk of 1.4%. If you want to minimize your risk you would need to go down to a return of 11.3% at 1.1% risk (red line, 80% Large cap, 20% TBill). That means sacrificing 7.1% return for reducing the risk by merely 0.3%. In conclusion, a good investment decision based on the results above, is the Large cap / Mid cap portfolio with the Large cap’s weighting higher than 75%. Pharma / Biotech is one of the most M&A intensive industries. Over a period of approximately 20 years, the industry has spent over USD 1.4 trillion in pharma / biotech acquisitions (excl. generics, OTC, Animal Health, CROs and CMOs acquisitions). The aim of this analysis is to assess which of the acquirers have really gained from those deals based on a simplified DCF analysis of the acquired R&D and marketed products (i.e. this excludes acquisitions of technology platforms that can enhance future drug discovery efforts, as this is extremely hard to assess). – Identified M&A deals performed by big Pharma and Biotech between 1994 and 2012. Brought forward (future value) of M&A expenditure prior to 2015 to 2015 (Valuation was done as of 31/12/2015) using an estimated WACC on a firm-by-firm basis. M&A deals post-2012 were excluded from the analysis because it was assumed that those deals cannot have an immediate or visible effect 3 years later. – Identified the marketed products acquired as well as the products that were still under the R&D phase at the time of acquisition. – Found the historical sales of marketed products (as well as forecasts if they are still under patent protection). – In regards to R&D products, if those products entered the market the historical and forecasted sales of these products were used. – Multiplied the 6-year (2010 – 2015) average Free Cash Flow (FCF) to Sales ratio of each firm by the sales of products to find FCF of each product. It should be noted that the R&D expenditure was added back prior to calculating each firm’s FCF to Sales ratio. The assumption is that, in the future, there will be no R&D expense on acquired marketed products (unless the acquirer decides to spend cash on R&D to assess if these marketed products can benefit other patient populations or be used in other indications). In the calculation of FCF for acquired R&D products, R&D expense was again added back to FCF. R&D expenses of an acquired R&D product were estimated based on three parameters: therapeutic category of each product, probability of success by phase, risk of the R&D project and time. Then the value of R&D expense was subtracted from the overall DCF value of each product. – Brought forward (future value) the calculated FCF of the products prior to 2015 to 2015 and discounted the calculated FCF sales post-2015 to 2015 (this was done by multiplying the forecasted sales by the FCF to Sales ratio using the same WACC used to bring forward the M&A expenditure). – Divided the total DCF value (acquired marketed + acquired R&D) by the total M&A Expenditure (by firm) resulting in the M&A ROI ratio. The acquirers included in the analysis were: Pfizer, Roche, Sanofi, Merck & Co, Gilead Sciences, Amgen, Bristol Myers Squibb, Shire, Biogen, Takeda, Merck KGaA, Eli Lilly, Celgene, Novartis, AstraZeneca, GlaxoSmithKline and Abbott Laboratories. The clear winner is Biogen. Biogen is the lowest spender (USD 2.8 bn.) and the value generated by its acquired product is USD 26.2 bn. resulting in an M&A Effectiveness Ratio of 9.28. What is really impressive is the fact that 98% of that value is attributed to acquired R&D products. This implies that Biogen has the ability to spot the “hottest” products that fit to the company’s existing R&D strategy and product portfolio. It also means that Biogen acquires biotech companies with potentially successful R&D projects in their pipelines ensuring the company’s long-term growth. Gilead and BMS have a much lower M&A effectiveness ratio than Biogen, but still relativey high considering the huge risk of R&D focused acquisitions. Both Gilead’s and BMS’s high ratio are attributed to the DCF value of acquired R&D products. Instead, Merck and Roche have generated value mostly through targeting companies with marketed products. These buyers will potentially face pipeline gaps in the future when the patents of the marketed products acquired expire. As a result, they would need either to keep making acquisitions of firms with established products in the market or focus on building a stronger internal R&D capabilities. Eli Lilly and Sanofi are breakeven, which means (at least in theory), M&A does not make any difference for them in terms of generating value. The clear loser is Pfizer, which is the biggest spender (over USD 500 bn.) while the value of its M&A product portfolio is close to USD 300 bn., meaning it has “lost” USD 200 bn. – WACC of the acquirer at the time of acquisition and after the acquisition changes. Also, the discount rate used in discounting FCF of a specific product (project) might differ from the discount rate of the business. In this case, WACC has been assumed constant and equal to the discount rate used to discount the FCF of each product. – A similar reasoning applies to the FCF / Sales ratio (which might differ between the products and companies), but for the purpose of this analysis it has been assumed that the ratio is the same across all products (under the same firm). – Sales were projected up to patent expiry. After the patent expiry, sales were assumed to be equal to zero, which might not be the case in real life. Usually there is a sharp drop due to pressure from generics / biosimilars, however the present value of the FCF during that period is likely to be very low. – R&D expenses of R&D products were estimated based on documented success rates by therapeutic category (see here) and out-of-pocket R&D expenditure as well as clinical development time frames (see here). The discount rate (or forward rate) used to account for time value of money was the firm-specific WACC except that the beta was changed each time a product entered to the next phase. It has been assumed that a beta of 2.5 is relevant for a research project, which was reduced by 0.25 for each of the next phases, reaching a beta of 1.25 when the product hits the market. Brand valuation is a major part of business valuation in certain industries such as food & beverage and consumer home products. For example, Coca-Cola’s brand value is estimated at USD 73 bn. (see here), accounting for 40% of Coca-Cola’s current market capitalization. But how does brand valuation apply in the context of pharmaceuticals? In theory, a pharmaceutical company’s brand has minimal value when it comes to generating revenue. That is because (again, in theory) doctors seek to prescribe drugs with high efficacy, safety and cost-effectiveness and thus, brand name does not (or at least, should not) affect doctors’ decisions. Therefore, it is interesting to investigate brand value in the context of OTC (i.e. drugs that can be bought without a prescription from a doctor, e.g. aspirin). Through my analysis I will attempt to value Bayer’s consumer care division and estimate the amount of value that is attributed to “brand name”. The reason I chose Bayer is that it generates significant OTC revenues and financial information on its OTC business unit is publicly available. Step 1: Estimate Market Value of OTC business. This will be achieved by using the EV / EBITDA and EV / EBIT multiples of Bayer and apply them to OTC business’s financials. Cash for the OTC business will be estimated by using an analogy of OTC EBITDA or EBIT to Total EBITDA or Total EBIT (depending on the multiple used to estimate market value of equity). Debt for the OTC business will be calculated based on the cash estimated as described in the bullet point above. A brief DCF model will be also used to validate the estimate market value of equity using the multiple approach. 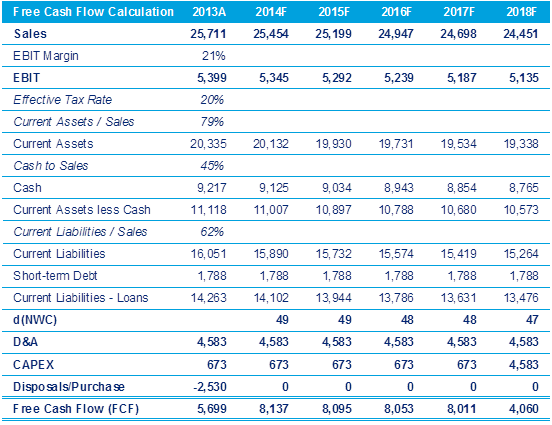 EBIT*(1-T) of OTC business will be assumed equal to Free Cash Flow (i.e. change in working capital is assumed negligible and capex is assumed to be equal to D&A. )This assumption is completely rational. When calculating terminal value in perpetuity Capex is equal to D&A in all DCF models. Terminal value is ~60% of the overall DCF value. Therefore, the potential effect of D&A not being equal to CAPEX (during the forecast period) on the DCF-derived market value of equity will be very small. The second assumption that can obviously be challenged is that change in working capital is assumed to be 0 which may not be the case. But since this is a “brief” DCF model, change in WC will be indeed assumed to be 0. Forecast period growth rate = compound annual growth rate in previous years (2007 – 2014) = 6.7%, a rational assumption for the sales forecast part of a simple DCF model. WACC of OTC business = WACC of Bayer = 9.29% This assumption can indeed be challenged since the risk profile of the OTC business is possibly lower than, for example, Bayer’s pharmaceutical business (OTC business’s WACC could be in the range between 6% – 8%). But again, for the sake of this exercise, it is assumed that OTC WACC is equal to overall WACC. The royalty relief method will be used to estimate the brand value of the Bayer’s OTC business. Across 26 comparable out-licensing deals that took place during the period 2000 – 2015, the average royalty rate for pharmaceuticals was close to 10%. It should be noted that due to lack of data available (or lack of deal-making) on OTC products, the sample of deals includes mainly prescription drugs. Based on the forecast period growth rate, the WACC and the growth rate to perpetuity, the brand value of the OTC business was estimated using the DCF method. The Market value of equity of the consumer care (OTC) business was estimated using both the EV / EBITDA and EV / EBIT method. EV that was estimated to stand at USD 100.6 bn. was divided by the company’s EBITDA and EBIT, arriving at an EV / EBITDA multiple of 9.8 and EV / EBIT multiple of 14.2. By applying those multiples on OTC business EBITDA and EBIT, we arrive at an EV of the OTC business of USD 14.3 bn. As mentioned previously, cash was calculated using the % of EBITDA of Bayer that is attributed to the OTC business (i.e. 14.2%) multiplied by Bayer’s total cash (USD 1,859 mn.). Instead, debt was calculated based on the % of cash that is attributed to the OTC business multiplied by Total debt. Both methods result in the same value, i.e. USD 11.7 bn. 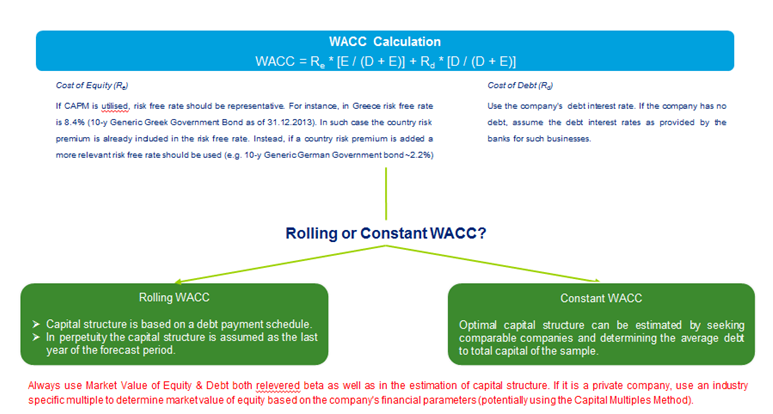 WACC was calculated as follows (bond values and coupon rates were taken from Bayer’s 2015 financial statements). Cost of equity was calculated using the Capital Asset Pricing Model: risk free rate + beta*market risk premium, where risk free rate = 10 year U.S. government bond as of 31.12.2015 = 2.2%, Bayer’s beta = 1.34 (as referenced in NASDAQ) and market risk premium = 6.7% (Ibbotson). 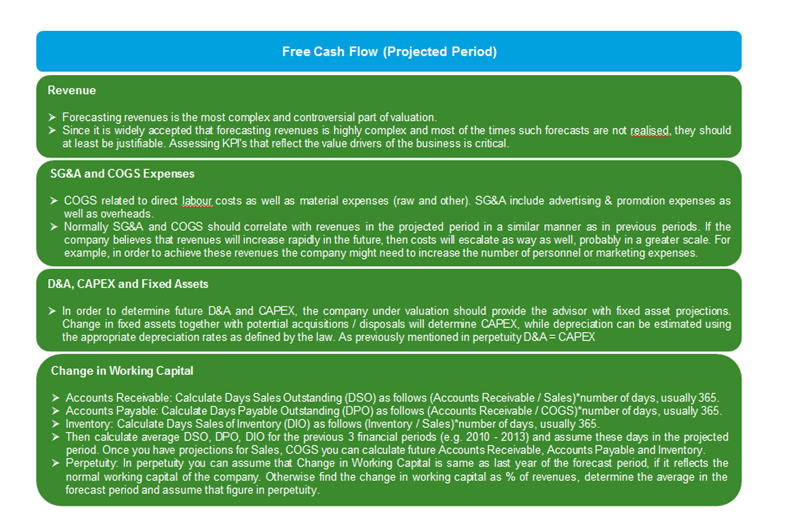 Free cash flow was calculated as follows: EBIT*(1-T)*(1+CAGR)^n + (EBITDA – EBIT), where n = year 1, 2, 3… and EBITDA less EBIT = D&A (added back since it is a non-cash item). Also, CAGR = 6.68% and T = 25% as indicated in Step 1. Using the DCF approach, the Market value of equity of the OTC business is estimated at USD 10.0 bn. A 25% weight was assigned to the EV / EBITDA and EV / EBIT method (i.e. a total weight of 50% for the multiples approach) and a 50% to the DCF method. The weighted average market value of equity of the OTC business was calculated as USD 10.9 bn. The results show that the market value of equity of Bayer’s consumer care business is approximately USD 10.9 bn. and its brand value is USD 7.5 bn. This implies that close to 70% of the value of Bayer’s consumer care business is attributed to its brand. The key takeaway from this analysis is that brand value of pharmaceutical firms strongly correlates with OTC revenue and hence total value. Investing in marketing and brand promotion can boost the value of an OTC business and as a result, increase cash gained in deal-making. Companies that operate in various healthcare related sectors can be strongly benefited from their brand , since consumer awareness of those firms is amplified (e.g. Johnson & Johnson). As a result, the price premium put on a potential sale of the business can also be higher. In my previous post (see here) I developed a static financial model that incorporated all the necessary parameters to evaluate the potential investment return gain for entrepreneurs and VCs after a successful exit (through M&A). The model incorporated what VCs usually ask from entrepreneurs: a percentage of the firm’s equity in the form of convertible preferred stock, liquidation preferences, control over the BoD and full rights of refusal. However, after some thought and further readings I have refined the model. The assumptions are more accurate and realistic so that the model can be applicable in the real world. NewCo is a biotechnology company that with its own funds and Angel investors has succeeded in bringing a drug from research to phase I and is currently seeking VC funding to progress its lead drug candidate into late phases. On average an early-stage biotech company needs $70m in total (nominal value) throughout the clinical development period (6 to 9 years). Due to the huge amount of investment required, the company plans to receive three series of investments: Series A, Series B and Series C. The company has 10m of outstanding shares at the moment. Exit strategy is M&A with an exit multiple of x6 (based on evaluatepharma data). In a successful exit scenario (M&A or IPO) a promising biotech firm can be acquired for x6 its total initial investment (i.e. $420m) in this case. Looking at these returns number, it might seem impossible for a pre-revenue firm to be valued at that level. However, if the firm has developed a highly innovative therapy that addresses an unmet medical need (especially in the orphan disease space) and has showed promissing phase II or phase III trial results, it is highly likely to attract big biotech / pharma for an M&A move. This is usually the case when a biotech firm has developed a fully-integrated technology platform enabling the potential acquirer to generate multiple drugs from the platform (i.e. not a one-off product company), which is where all the “future value” comes from. However, if the acquirer is a troubled, cash-cow, big pharma company that is unable to innovate and therefore looks for a short-term pipeline refill, the target company might very well be a single-product business. In short, this example demonstrates the value that can be generated from a very successful mid-stage biotech firm. As you can see in a successful exit of the NewCo, an incredible amount of wealth is created for both VCs and entrepreneurs. But what happens if series A and B investors exercise rights of first refusal? In that case entrepreneurs get 1/7th of what they would normally get without first refusal rights (which is the case in most VC deals). 1) Time value of money has been ignored for simplicity: This is a static model examining the relationship between the value and the early-stage investing at discrete time points (pre-money and post-money). The model does not take into account the changing risk profile of the company as it gets closer to the market. 2) All VC investments are assumed to be allocated for R&D, personnel and other operating or capital expenses. Any potential net income is assumed to be reinvested in the company. The key takeaway from this analysis is that VC deals always dilute entrepreneurs and, in exchange, entrepreneurs can achieve a value-adding exit that can help them become wealthy and fund future start-up ideas. As they say in the VC world “its better having 5% of something than 100% of nothing”. You can download the model here. “Shark Tank” is one of my favourite TV Shows. Not only because it is related to the early-stage investment field that is the main driver of major economies but also because it is fun to watch. The way that all interesting (or not) ideas are presented and pitched to high-net worth investors stimulates your mind and makes you think “how did that folk come up with this?”. Some of the inventions do receive funding, some do not. Before an investor says “I am out” or “I will make you an offer”, he/she explains the reasoning behind the final decision and that is where all the learning process is centered. Watching numerous pitches I noted some key challenges entrepreneurs face as well as the reasons their ideas are rejected, sometimes harshly. Timing: Coming up with a novel invention that is marketable and has significant potential to generate profits and return on investment is great. However, entering the Shark Tank as a pre-revenue firm will not help you survive in the tank. Investors want some kind of track record that will attract their interest and eventually persuade them to invest in the target firm. Going too early will not necessarilly kill you but going too late certainly will; Asking for funding for an idea that started 7 years ago, has generated very few sales and has burned all the cash invested by the entrepreneur (or other investors) is certainly not appealing to the sharks. Getting Distribution: A potentially money making business will attract the interest of investors but what usually troubles entrepreneurs is when they are asked “how do you get distribution?” Many entrepreneurs make the mistake to assume that they can do everything on their own. That is a no-go for the sharks especially when founders are not open-minded to suggestions and insist on the idea of going alone. Asking for too much: I have seen so many ideas that have a great potential but are killed because entrepreneurs ask for so much cash for so little equity that makes investors not even think about making a counter-offer. These sky-high valuations proposed by entrepreneurs would make the investment prohibitive for any investor around the world. Character: Commitment and ability are the main personal characteristics that the sharks want to see in an entrepreneur. Having a full-time job while trying to go forward with an idea shows no commitment and of course, no willingness to take risks. In such case the idea will be, most of the times, considered a hobby rather than an actual business. Demonstrating the ability to sell and to take initiatives are skills that are always needed to have. Being hesitant to pick up the phone to call potential customers will make the sharks thing that they have to do all the work and that is not possible as they have their own business to run. I.P. protection: being copied by a large retailer that can manufacture the exact same item in a matter of days will not get you any market share, ever. Having a patented or at least patent pending invention is a pre-requisite before even talking about numbers. Margins / Pricing: If the product is too expensive or has very low gross profit margins will be considered as a threat to receiving a return on investment. Provided that the sharks decide to invest in the business, this will be a drawback. Entrepreneurs may overcome this challenge if they use investors’ cash to place orders of their products from manufacturers in large batches so that the cost of goods sold can go down. Ethics: Presenting a controversial idea might make investors re-consider to invest in the target business. But it is not only about ethics. It is also about a potential distortion of investors’ image. And that is something the sharks want to avoid. Deal Structure: Being open to accept various deal structures is crucial. It is unpleasant to see a businesses not receiving funding because a specific deal structure is not preferred by entrepreneurs, even though the shark’s overall offer is very close to entrepreneurs’ initial offer. Honesty: Showing honesty and integrity is vital. Presenting a product that is a part of the business and hiding the real “juice” will make sharks hesitant to invest in that person and think that a mutually beneficial relationship cannot be established. Marketability: As mentioned previously an idea or product must be marketable and appealing to customers. If not so, it will be a low revenue business that will not succeed in the long-term. Investors certainly want to avoid that. In summary, entrepreneurs should avoid making these mistakes in order to maximise their chances of receiving funding. An innovative idea must be complemented by positive investment prospects as well as good personality traits. Biotech stocks have demonstrated enormous growth during the past few years (see: The U.S. Small and Mid-Cap Biotech Shines: Stocks on the Rise). The average stock return for biotechs was found to be over 40%, depending on the date of reference during the post-IPO period (see: Post-IPO performance of U.S. Biotechnology Companies). 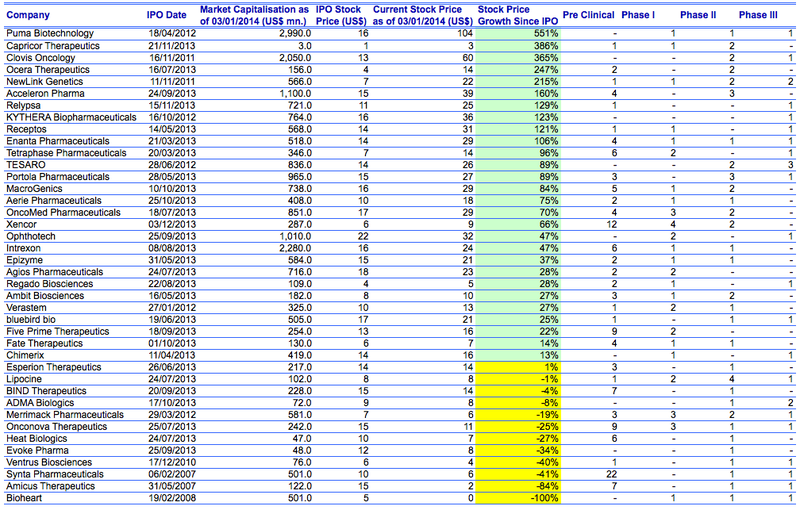 Biotech firms can generate huge stock returns since their IPO offer price. But what about actual returns to investors? VC investment deal value for companies that successfully achieved an IPO exit, hit a 10-year high in 2014 (USD 8.0 bn.). It seems that biotech has recovered fully since the global financial crisis (Figure 1). Average VC investment deal per financing is also the second-highest during the same 10-year period. One major observation is while the number of financing rounds has remained almost flat since 2006 at 400 – 480 financings, the amount of funding has been increasing at a 3% CAGR. Despite the VC investment hype for biotech, the same cannot be said for the total amount of money raised through IPO, as well as for the average IPO raised per company (Figure 2). From the previous graphs, IPO Raise to Average Deal Value can be inferred. It seems that the markets hype to pay significant premiums compared to VC investments, peaked in 2011 when the corresponding multiple reached 7.2 x. Since 2011 however, the multiple has dropped to the levels of 2006 – 2007. (Figure 3). It would be interest to see how VC investments are distributed by phase and by therapeutic area. Approximately 70% of the investments are made to biotech companies 20% to specialty pharma, while the rest of the investment to miscellaneous technologies (generics, OTC etc.). The following two graphs present the pipeline profile of the companies targeted by VC Investors (Figure 4 and Figure 5). It is clear that VC investors target companies whose pipeline is mostly at an early stage (62% pre-clinical and drug discovery), as investors understand that innovation comes at early stage and the value added of these medicines is strongly correlated with scientific expertise and money invested during those stages. A similar trend is observed when looking at pipeline of target companies by therapeutic areas. Approximately half of the pipeline of firms targeted by investors is in CNS and Oncology which are the most challenging areas both in terms of finding treatments and in terms of chance of success during clinical trials. 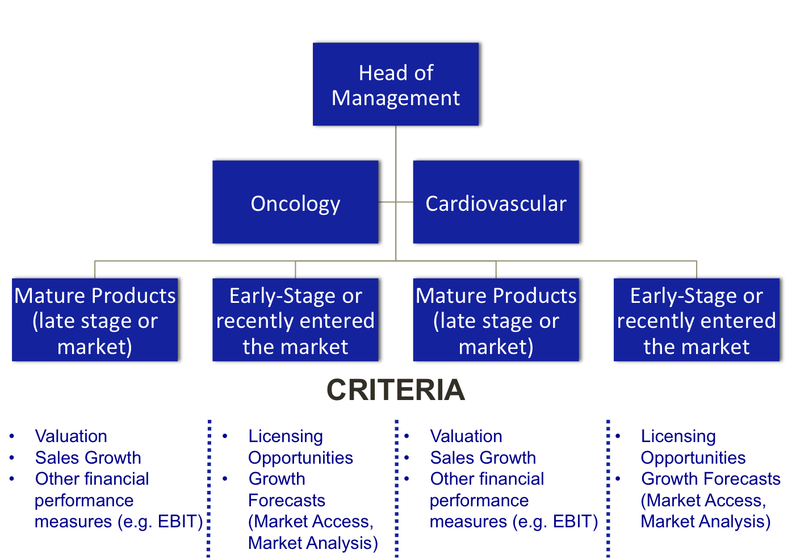 Observation 1: The typical profile of a firm receiving investment from VCs, is a firm with CNS and Oncology drugs still at the drug discovery and pre-clinical stages. Investors are targeting these high risk biotech firms as they have a huge potential of bringing more than satisfactory returns through successful exit. Observation 2: Total VC investment experienced a growth during the last 4 years, while the annual average deal size has been constantly declining from 2006 to 2013 demonstrating an upward trend only in 2014. Average IPO raise per year has been ranging from USD 65 mn. to USD 80 mn. Although in 2014 a decreased multiple of IPO raise to VC investments (4.5 x) is observed compared to previous years, it still demonstrates a strong appetite by capital markets to invest in those companies. Key Takeaway: VC investors believe in high-risk early stage biotech firms with promising pipeline in challenging areas that will bring high returns through exit. At a market level, market investors continue to invest in biotechs that have successfully exited and have huge potential for realising stock returns far exceeding market-average. Investments are the principal growth driver of our global economy. The motive behind every investment shapes the investment deal structure and therefore plays a significant role on the outcome of every investment. This article highlights the main differences between strategic and financial buyers. Buyers can be classified as investment and corporate buyers. There exist general investment firms who acquire both private and public companies. In addition, there are Investment buyers focused on the private market such as Private Equity (PE) & Venture Capital (VC) firms and capital markets investors such as investment banks and funds (mutual funds, closed-end funds and unit investment trusts). It should be noted that investment banks and funds usually do not acquire entire companies but acquire certain amount of securities from different companies (“baskets”). Corporate buyers are companies performing acquisitions for various reasons. Buy-outs is inherent in some companies’ strategy as opposed to companies who aim at growing organically. For instance, Pfizer has performed numerous acquisitions over the past few years while companies such as Merck and GlaxoSmithKline are more focused on internal growth and are much more selective when it comes to M&A. Hybrid models of the above main categories have also been developed, for example, corporate investment arms which are “arms” of large corporations that target firms in relevant sectors and segments. They also aim at bringing high return on investments as well as identifying potential interesting targets for the larger corporation. What are the main differences between strategic and financial buyers? In terms of motives, financial buyers are more interested at maximizing return on investment (through a successful exit) by providing access to additional capital and leverage for the target company, if necessary. Instead, strategic buyers aim at acquiring companies that will benefit the existing establishments (by for example, product or technological complementarity, access to new geographical areas, boosting product pipeline, enhancing product discovery and design, acquiring successful marketed products and expanding manufacturing or distribution capabilities) whether this is an add-on acquisition by a PE firm or a corporate buy-out. This is achieved through synergies which is particularly difficult to achieve especially when multinationals are involved due to post-merger integration issues. Financial buyers are more flexible in proposing alternative deal structures due to their expertise in Finance and investments as well as due to their flexible model of receiving returns which can be achieved in various ways. Instead, strategic buyers want to acquire an entire Company in order to expand and the alternatives are very few. At a theoretical level, strategic bidders value targets higher than financial bidders due to the potential financial gain from synergies. In practice, the uncertainty and difficulty of achieving synergies as well as the higher due diligence costs involved in strategic acquisitions, strategic bidders offer price is highly volatile. Instead, financial bidders are more tolerant to higher deal values due to the better financial position. Company A seeks an investor that will provide access and the ability to expand in new markets but keep its employees and the key management unaffected from the acquisition. Company B wants to cash out and wants the highest price possible. Company C seeks an investment because of its high leverage and is negative profitability. Company D seeks funding to use it in its research and development in order to bring its product in the marketplace. 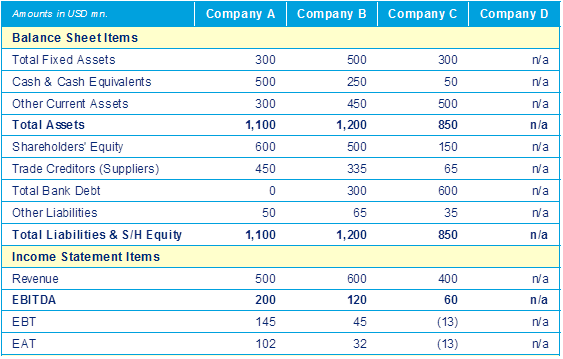 The financials of these companies are presented in the table below (Table 1). Using the information above in combination with the financial information provided, we may determine the appropriate type of investor for each company. Company D is an early-stage company with no marketed products yet and therefore it has not produced any financial statements. Company A wants to keep its employees and therefore a financial investor is more appropriate. That is because, strategic investors usually integrate the acquired company in their operations which implies employee layoffs and general organizational restructuring. However, the financial investor must be specialised and have the expertise in the relevant sector in order to provide Company A with new opportunities of expansion. Company B wants to cash-out and maximize selling price and therefore it shall mainly a strategic investor. Company C is highly leveraged and needs a debt restructuring which can be provided by a distress fund. Company D is still at the research level and seeks early-stage funding. Therefore, a Venture Capital or Private Equity investor is most appropriate. Table 2 summarizes these results. Financial Modelling is both an art and science as it is not only based on Corporate Finance Theory but also on the ability of the Analyst to put theory in practice. This articles describes some common mistakes in Discounted Cash Flow (DCF) valuation, the principal method for valuing a business. Suggestions have been made to deal with these errors in three levels of DCF valuation: WACC calculation, Free Cash Flow calculation in previous periods as well as in the projected period and other common financial modelling mistakes. 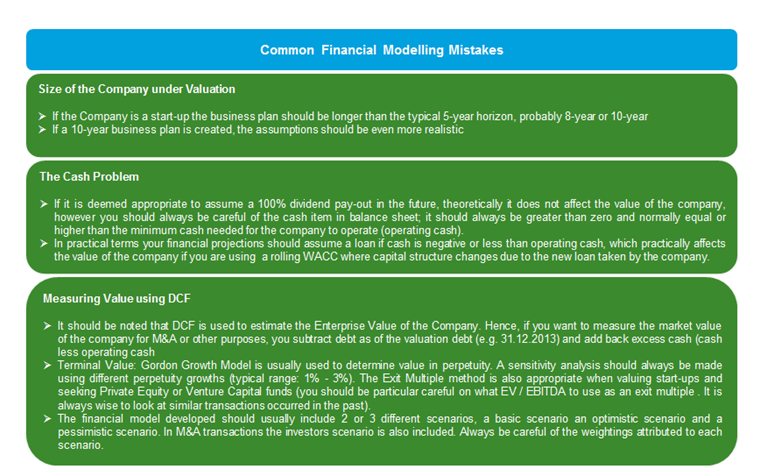 In conclusion, these are the most frequent mistakes involved in DCF modelling and valuation. In practice, the valuation of the Company might not very much differ if you do not correct these errors, however it is particularly crucial to acknowledge such errors and correct them before being challenged by a potential strategic or financial investor. Pfizer AstraZeneca M&A Rumors – Is US$ 101 bn. the Right Price? It is rumored that Pfizer will strike a US$ 101 bn. deal for acquiring AstraZeneca. AstraZeneca’s market capitalization prior to these rumors (17.04.2014) was US$ 80 bn. If these rumours are true it means that Pfizer is offering 25% premium over the market capitalization of AstraZeneca. Is this a fair price? Normally, the price offered for acquiring 100% of a Company’s ownership should include: the current market value of equity of the target, the control premium over and above the market value of equity and a part of the present value of the expected synergies that will benefit the acquirer in the future. 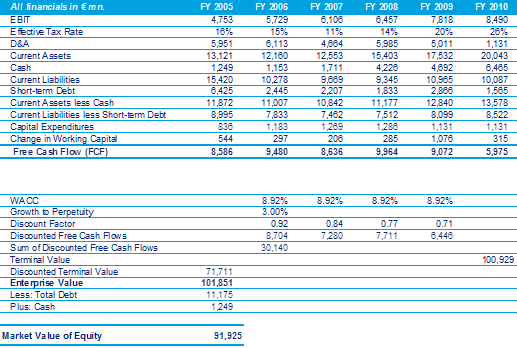 A very rough Discounted Cash Flow model to estimate AstraZeneca’s market value of equity is presented in the Figure 1. According to various sources (including the Financial Times) AstraZeneca’s revenues will decline in the future as a result of major patent expirations including that of Nexium, Symbicort and Crestor during the period 2014 – 2016. By assuming a Compound Annual Growth Rate (CAGR) of -1% and a stable EBIT margin the free cash flow to the firm has been estimated. The market value of equity is the sum of the discounted free cash flows and the discounted terminal value. This is presented clearly in Figure 3. The amount estimated through DCF incorporates already the control premium but excludes expected value gained from synergies for the acquirer. Based on the analysis presented above the market value of AstraZeneca is US$ 101 bn., exactly the amount Pfizer is offering according to rumors. The price is right. But will AstraZeneca accept such deal? Biotech equities have sky-rocketed during 2013. As it is evident from the graph presented below, on Friday 3rd of January 2014, the NASDAQ Biotechnology Index closed at 2,373 a 58% rise compared to 1st of January 2013. In terms of past trends for those companies, the IPO offered stock price and the current stock price have been included as well as the stock price growth since IPO. It can be inferred that the majority of these equities have already sky-rocketed, before even any of the products of these companies enter the market (highlighted in green). This is a signal of “trust” of investors in these companies, as potential return on investment in case products enter the market, is huge. In my view, the companies with slightly negative stock growth with very few late stage products are those to be watched as their future cash flows depend on the status of these products and everybody waits to see if they demonstrate positive clinical trial results (highlighted in yellow). It should be noted that the analysis above purely depends on the financial performance of these stocks and the number of clinical trial products. It does not say anything about the quality of the companies’ products and the operational performance these companies. Hence, this analysis should, at no circumstance be used as an investment advice. Disclaimer: The author does not hold stocks of the companies presented in the article or has not any direct / indirect financial interest with these companies. Valuing start-up and early stage biotechnology companies is particularly difficult. In particular, early stage biotech and pharma companies have high sunk costs (i.e. fixed costs that cannot be recovered) and at the same time few or no sources of revenue at all. As a result most or all their Profit & Loss (P&L) items such as EBIT and Net Income have a negative sign. This restricts the ability to value these types of companies through a Comparable Multiples Method (CMM) or Comparable Transactions Method (CTM). Therefore, DCF and Venture Capital Method (see: A Simple VC Investment Model: What every Biotech Entrepreneur should know) of major importance. This article will focus on how DCF and NPV can be applied to value an early-stage biotech company. R&D Cost by Phase: This can be provided by the Management of the company (as estimates). For the purpose of this analysis the figures provided by Bogdan and Villiger. Discount Rate: Discount rate of the project can be assumed to be the same as the discount rate of the company, if the company has one project or very few similar ones (i.e. same therapeutic area – same risk etc.) Discount rate (and more specifically, beta) decreases each time a drug passes to the next phase of clinical trials because the project becomes less riskier as the product gets closer to the market. The discount rate is estimated through the Capital Asset Pricing Model (CAPM). Post-approval revenues and costs: In order to value the company sales forecasts are needed. That is particularly hard and risky to do because of the uncertainty of the market, the economy, the regulation or even tax policies in general in 6-7 years from now. However, revenues and costs are necessary to estimate future free cash flows of the firm or the project. P&L and Balance Sheet items: Items such as Cost of Goods Sold (COGS), Selling, General and Administrative (SGA) costs, EBIT margin, CAPEX and Working Capital will be assumed as a % of sales based on comparable companies (high growth, medium growth and maturity companies). Free Cash Flow calculation (2/2): If revenue projections have not been provided by the management of the company then there are two alternatives. The first one is the market method and the second is the comparable method. The former suggests that the market forecasts and statistics should be found (e.g. if the product is a cancer drug then forecasts for the oncology market need to be found – it would be even more relevant if forecasts of the subsector can be reproduced i.e. if the product is monoclonal antibody cancer drug, then research the monoclonal antibody cancer market). Then estimate the therapeutic area’s statistics (potential number of patients targeted for the treatment based on disease prevalence) estimate pricing (search for comparable products to see prices and look for social insurance reimbursement percentages) and of course examine market access and penetration issues that may arise and perform quantitative (by looking at past products) and qualitative analysis (ask doctors whether they would prescribe that drug or not, do questionnaires, focus groups etc.) based on this information. Initial Sales that result in an NPV = 0 have been used (i.e. USD 132 mn.). Sensitivity analysis has been applied to observe how initial sales shape NPV of the project (see Step 5). Figure 6 depicts the exponential effect of sales CAGR on DCF Valuation for different initial sales values while initial sales follow a linear relationship with DCF valuation for different CAGR. For a minimum initial sales of USD 25 mn. the product needs a CAGR of 35% for a positive NPV, while for the minimum CAGR of 15% initial sales should be at least USD 200 mn. in order for NPV to be positive. There are various financial modelling difficulties (subjectivity, unreliable forecasts, risk) in DCF but these can be reduced if the company to be valued has already secured a licensing agreement of its product(s) with a big pharma company. Then a Comparable Licensing Deals Valuation can be applied, in which the appraisal is based on licensing and royalties revenue development and how costs are distributed between the licensor and the licensee, what is the risk and value shared etc. For VC-backed early-stage biotech/pharma companies there is also the Venture Capital Method which can be more accurate as it is based on investors’ requirements (return, exit strategy etc.). If the investment fails the company is in trouble while the investors moves on to another company and expect that their return on investments to the next company will cover the cost of the failure (+ profit) from the previous investment. Of course there can be a combination of the methods outlined above, i.e. a VC firm will probably invest in a company that has already proven its ability to potentially develop successful products, i.e. a company that has already out-licensed one of its products. Such company will probably have less strict terms by the VCs as opposed to a company that has not secured any deal. In that case, model-wise, a valuation model should be considered that will incorporate VC investments as well as licensing deals. Viropharma Acquisition by Shire Pharmaceuticals: Was the price right? Shire Pharmaceuticals acquired Viropharma for USD 4.2 bn. Was the price right? What does Comparable Multiples Method say? In order to determine whether the price was right, a sample of comparable (publicly listed) companies was collected together with their multiples (Figure 1). Values marked with red colour represent outliers. In Figure 2, the market value of equity of Viropharma was estimated based on the multiples presented above. It should be noted that equal weights were given to all multiples which resulted in a weighted average market value of equity of USD 1,658 mn. From January 2012 to September 2013 (i.e. until Shire Pharmaceuticals showed interest which could have effect on share price), market capitalisation of Viropharma was ranging between USD 1,342 to USD 2,309 mn. with average market capitalisation (over the same period) being ~ USD 1,785 mn., converging highly to the market value derived through the Comparable Multiples Method (difference of the order of 7%). Therefore, it can be implied that the market valued Viropharma “realistically”. Control Premium is approximately 20% of the market value of equity. Since market value of equity and acquisition price are known, synergies premium should be of the order of USD 300 mn. This amount may also incorporate the Net Present Value of Viropharma’s pipeline (1 pre-clinical, 2 phase I and 5 phase II products). Indeed, according to the Financial Times through this acquisition, Shire Pharmaceuticals may achieve synergies of USD 150 mn. by 2015. From a valuation perspective, it can be concluded that Shire Pharmaceutical’s offer converged to market reality, mainly arising from the reasonable total premium offered. In this article the Comparable Multiples Method (CMM) is discussed and analysed. CMM is based on a relatively basic principle; that the value of the target company (the company to be valued) can be derived through certain multiples (financial ratios) of similar (comparable) companies. Subsidiaries: number of subsidiaries, subsidiaries’ sector of operation. Global Strategy: M&A, organic growth, future potential. Number of competitors and potentially perform a SWOT and Porter’s 5 forces analysis as well as create a BCG matrix. Revenue structure: breakdown of revenues by area. For example, a company active in the Oil & Gas industry could segment its sales by type of product sold Natural Gas sales, Petroleum Sales, Bioethanol etc. Cost structure: Where does the company spends its cash on compared to the industry? R&D, Marketing or Manufacturing? Bench-marking of competitors and the target. The comparable companies should have similar Financial and Non-Financial Data (as in Step 1) with the target. At a later stage CMM will be applied on Sanofi, the meaning of “similar data” will be clearer and more specific. There exist two different types of multiples. These are Enterprise Value multiples and Equity multiples. Enterprise Value multiples: enterprise value (EV) is defined as Market Capitalisation + Net Debt (i.e. Debt – Cash). It is partially market-dependent (due to the market capitalisation component) but it has a significant enterprise specific element (net debt). The most commonly used EV multiples are EV/Sales, EV/EBIT, EV/EBITDA and EV/Free Cash Flow. Equity multiples: these are multiples which are based on the market value of equity of the comparable company. PE ratio, P/Sales, P/Book Value and P/Operating Cash Flow are mostly used. Before estimating the average and the median of the multiples above a careful consideration shall be given when ruling out outliers. Outliers are numerical values diverging from most of the sample. It should be noted that the median is estimated for ensuring that the sample is uniform (i.e. all outliers have been excluded, sample is converging). After analysing and deciding on the final multiples the market value of Equity and the Enterprise Value can be estimated based on the corresponding multiples and financial data of the target company (e.g. if the average of P/Sales of the comparable companies has been estimated, then it should me multiplied by the sales of the target company to measure what its P is i.e. its market value of equity). By assessing the characteristics of the sample one could observe a number of problems. Firstly, comparable companies in terms of market size are missing apart from Johnson & Johnson, which however, has a large medical devices segment and could be considered non-comparable. For the purpose of this valuation, Johnson & Johnson will be included. The second problem is the size of the sample. The sample contains 6 companies which is sufficient only if it contains highly comparable companies. 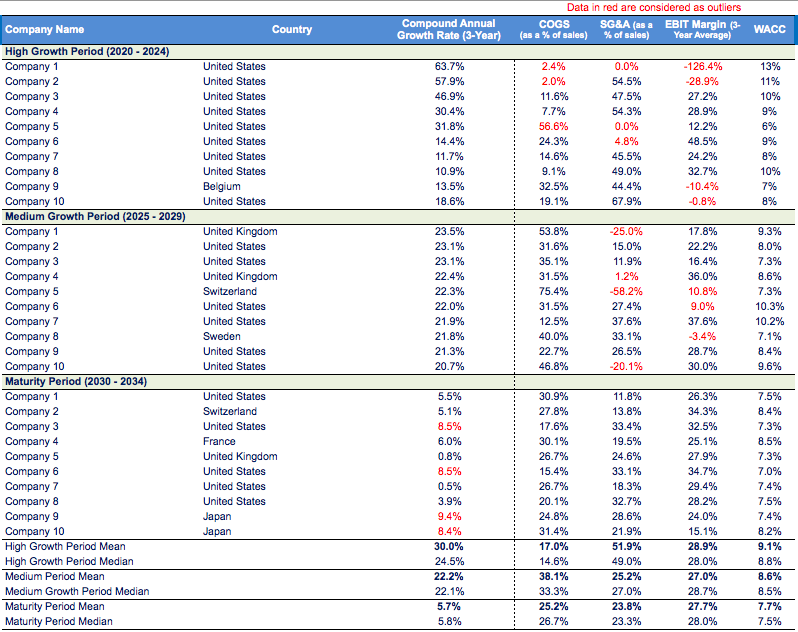 In the table below the multiples of the comparable companies are shown. Highlighted in red are the outliers which have been excluded in the calculation of the average and the median (click on the picture to see the actual numbers more clearly). The table below presents the process of estimating the total market value of Sanofi Aventis’ equity based on the derived transaction multiples. Net Debt has only been subtracted from Enterprise Value to determine the market capitalisation of the company as figures derived from equity multiples are market values of equity. Using the CMM approach the market value of equity of Sanofi-Aventis as of 31.12.2005 was estimated at € 92,954 mn. The market capitalisation of Sanofi-Aventis was € 103,656 mn. (31.12.2005). In CMM one collects a sample of comparable companies based on both financial and non-financial criteria. Equity and enterprise multiples are collected for the comparable companies and the average and median are calculated for the comparable companies and outliers are excluded. Thereafter, the average multiples are applied to the target company. Net debt has to be subtracted from the enterprise value derived from the comparable multiples, as equity multiples estimate the market value of equity and the aim is to compare these values to the actual market capitalisation of the target company. Although a 10% deviation between the derived value and the actual market capitalisation of Sanofi-Aventis can be considered as huge when considering share price performance, CMM is highly sensitive to the selection of the sample and the average multiples. A difference in a decimal point in a high-weight multiple can have a large impact on the final value of the company. The next article will focus on the Comparable Transactions (CT) methodology and provide an overall summary of the valuation results from the 3 methodologies (CMM, CT and DCF) on Sanofi. Can biotech Mergers and Acquisitions save big pharma? A question that seeks answer in view of the challenges that the pharma industry is currently facing globally and specially in Europe. Pharma has to find ways in order to improve Research and Development (R&D) productivity by reducing development time frames, R&D costs and increasing the chances of success from pre-clinical phases to market launch. As these interdependent factors have remained stable or even worsen (cycle times and probability of success at each phase have not changed significantly while R&D costs have impressively increased since 1990s) pharma has to seek other methods in order to overcome these huge challenges. i) Entrance to new therapeutic areas with unmet medical needs and large market potential can, in the long-term be a source of ensuring cash inflows. Adapting such entrance directly at emerging markets (BRIC) can prove successful. ii) Filling the pipeline gap. iii) The convergence of diagnostics with pharmaceuticals for efficient and effective drug delivery that can prove to be an additional revenue source which can then be re-invested for R&D purposes. iv) Developing orphan drugs, not so much for financial reasons but for restoring industry’s damaged reputation. v) Personalised medicine; need to say more? From a company’s strategic perspective there are two main pathways for achieving these solutions: M&A and organic growth. M&A has been well-incorporated as a significant part of pharma companies’ strategy, mainly big pharma. But what are the major features of these deals in the different M&A waves? During the 1980s and 1990s there was a significant amount of pharma-pharma “mergers of equals” (at a national level) aiming at gaining knowledge about monoclonal antibodies and genetic engineering for drug discovery. In the post-merger period absorption was the most common integration technique. From the late 1990s onwards, particularly after the genomics boom, the investment community realised that there are many years ahead for the sequencing of the human genome to actually add value both financially and medically. From that point onwards, for pharma, issues such as clash of cultures, post-merger integration techniques and potential disruption of R&D, were secondary. The pharma industry performed many mega-acquisitions and hundreds of small acquisitions which had one key characteristic in common; most of the companies acquired were biotech companies present in different geographical areas (cross-border M&A). A preservational approach was used as a post-merger technique to avoid cultural clashes and financial risks as well as the time consuming and extensive process of due dilligence (which can strongly disrupt every-day decision making). The key drivers for this shift from national mergers in order to dominate, to acquisitions in order to fill the pipeline gap are mainly the intense competition from generics (70% of prescriptions in the U.S., see source 1), patent expirations (between 2010-2014 the revenue of the prescription sector is expected to be reduced will by approximately US$ 110 bn, source 2) and the pressure for lower healthcare costs (as buyers demand lower prices and reference pricing is a growing pricing strategy for public healthcare systems). However, why did pharma choose biotech? As an industry expert had once told me “pharma missed the boat” and so it wants to catch up. But regardless of this historical explanation the main reason that big pharma focused on M&A of early and mid- stage biotech firms is biotech’s strong R&D platforms and high prospects (although having equity as the only source of funding and make little or no revenues). Pharma companies also have strong R&D focus but marketing and sales force effectiveness remain the number 1 in terms of resource and cost allocation. It has also been concluded that biologics have an overall higher chance of approval compared to chemical compounds. In addition, generics are an exact copy of branded drugs, while for biologics there are biosimilars. There is a much greater difficulty for developing biosimilars and hence, this can provide pharma companies by acquiring biotech firms, a “virtual” extention of market exclusivity. 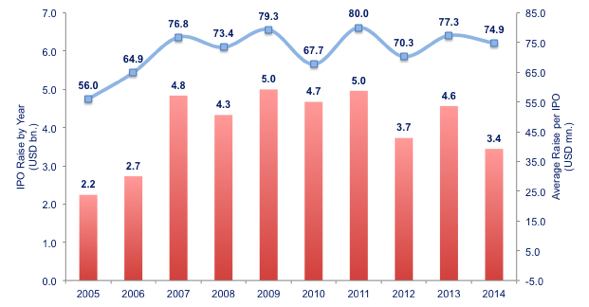 Coming back to M&A trends; M&A intensity has remained fairly stable particularly after the beginning of financial crisis in 2008. M&A model of growth is shifting towards a hybrid model in which pharma companies form strategic alliances/partnerships or perform licensing deals with biotech firms paying them in tranches rather than up-front. In such performance-based approach pharma decides whether to acquire the biotech firm in the future or not based on its success or failure during the partnership. The last model of growth is organic growth. This is the model followed by biotech companies up to the point which they are acquired from pharma (e.g. Sanofi-Genzyme, Roche-Genentech, AstraZeneca-MedImmune etc.). Companies that have grown organically are characterised by a high degree of autonomy and independence. But even Merck, the brightest example of such growth model, performed its first mega-acquisition by acquiring Schering-Plough in 2009. Organic growth for big pharma is not a solution anymore in such a mature and saturated market. For biotech firms, it can both be an exit strategy and a viable growth model to ensure their survival. So can biotech M&A save pharma? In such an uncertain and ever-changing environment, the answer is: it depends. It depends on the type of M&A (horisontal or vertical, friendly or hostile), on the expectations and reactions of the investors and finaly it depends on post-merger financial strategies (do you follow the same straight-forward cost-saving strategy in R&D as in sales and marketing?). In my view, a hybrid model is required: performance based preservational M&A in combination with open innovation (in-licensing, out-licensing) and strategic alliance/partnership formation. Most big pharma companies have already started choosing this model realising its declining R&D productivity but its strong marketing and sales effectiveness; Incorporating biotech’s R&D focus and rational compound targeting and pharma’s marketing success can eventually prove to be a viable and successful business model.